The bottom line is that financial markets now anticipate three to four increases in the federal funds rate in 2018, which is up from an expectation of two or three hikes just a few months ago, with the next increase likely coming at the March 20–21 FOMC meeting. The brighter economic outlook—which has been boosted by passage of tax reform—has not only strengthened growth prospects but also increased forecasts for accelerated prices and wages. Along those lines, a number of recent business sentiment reports have reflected elevated input cost expectations over the next six months. This included two surveys out last week—a national one from IHS Markit and a regional analysis from the Kansas City Federal Reserve Bank—which found that raw material prices should grow over the coming months at rates not seen in at least five years. To be fair, as the FOMC minutes note, core inflation remains modest and largely under control for now despite those increased expectations. Manufacturers will get a new reading for the core personal consumption expenditure (PCE) deflator—the Federal Reserve’s preferred measure—on March 1, but in December, it increased just 1.5 percent year-over-year. This illustrates the Federal Reserve’s case that overall inflation remains below its 2 percent target. 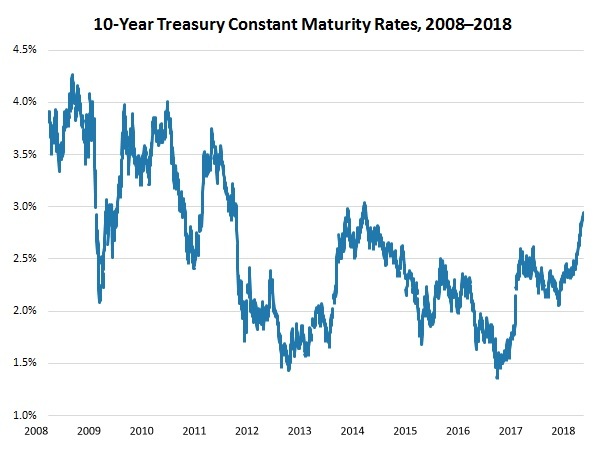 Nonetheless, the strengthened outlook for growth (and the prospects of more federal funds rate increases) has sent interest rates higher, including 10-year Treasury bond yields, which have soared to four-year highs, approaching 3 percent. Encouragingly, the beforementioned surveys continue to show strong growth in manufacturing activity. For instance, the IHS Markit Flash U.S. Manufacturing PMI registered the best reading since October 2014, and the index for future output was just shy of December’s reading, which was nearly a two-year high. Likewise, the Kansas City Federal Reserve’s composite index of general business conditions increased to a four-month high, building on solid growth over the past year. More importantly, the forward-looking measure of activity for the next six months soared from 29 to 38, an all-time high in the survey’s 17-year history. More than 60 percent of respondents anticipate higher new orders, production and shipments in the coming months, with 46 percent and 48 percent seeing more employment and capital spending, respectively. Meanwhile, existing home sales decelerated for the second straight month, down 3.2 percent in January. Sales of existing homes declined from 5.56 million units at the annual rate in December to 5.38 million units in January, the slowest pace since September. Despite some easing in the past two months, the good news is that existing home sales remain not far from November’s rate, which was the fastest since February 2007. There were 3.4 months of supply in January, up from 3.2 months in December but down from 4.2 months in September. As such, supplies have trended generally lower, helping to raise list prices. The median existing home sales price was $240,500 in January, up 5.8 percent from one year ago. There will be a number of important data releases this week for financial markets to process. On Tuesday and Wednesday, new Federal Reserve Chairman Jay Powell will give his first monetary policy testimony before Congress, likely touching on the topics discussed above. Markets will be watching his words carefully for clues about the pace of policy changes in 2018 and beyond. In addition, on Wednesday, there will be a first revision for fourth-quarter growth in real GDP, which was estimated originally to be 2.6 percent. That prior estimate included large drags from inventories and net exports, which were likely overstated, and as such, there may be an upward revision of that figure to something closer to 3 percent. Moreover, there will be several reports on the health of the manufacturing sector, including the latest surveys from the Institute for Supply Management and the Dallas and Richmond Federal Reserve Banks, which should reflect continued strong growth. Other highlights this week include updates on construction spending, consumer confidence, durable goods orders and shipments, the international trade in goods, personal income and spending and new home sales. The Conference Board’s Leading Economic Index (LEI) jumped 1.0 percent in January, continuing to reflect a U.S. economic outlook that is trending in the right direction. Over the past six months, the LEI has risen by a healthy 3.8 percent, which bodes well for solid economic growth moving forward. New orders for manufactured goods were among the bright spots in the latest data, providing nearly one-quarter of the increase in the headline figure in January. Building permits, consumer confidence, the interest rate spread, overall lending conditions and stock prices also made notable positive contributions to the LEI in the latest data. Meanwhile, the Coincident Economic Index (CEI), which assesses current conditions, edged up 0.1 percent in January, extending the 0.3 percent gain in December but rising at the slowest pace since August. Industrial production was the lone drag on the CEI in January, as it pulled back on reduced mining output for the month. For its part, manufacturing production was unchanged in January, with 1.8 percent year-over-year growth. Each of the other components of the CEI—nonfarm payrolls, personal income and manufacturing and trade sales—contributed positively to the index for the month. The National Association of Realtors (NAR) reported that existing home sales decelerated for the second straight month, down 3.2 percent in January. Sales of existing homes declined from 5.56 million units at the annual rate in December to 5.38 million units in January, the slowest pace since September. Despite some easing in the past two months, the good news is that existing home sales remain not far from November’s rate, which was the fastest since February 2007. The underlying data in January showed mixed results. Existing single-family home sales declined from an annualized 4.95 million units in December to 4.76 million units in January, but condominium and co-op sales edged up from 610,000 to 620,000. Existing home sales fell in every region of the country, with the largest decreases in the Midwest and West. On a year-over-year basis, sales declined 3.2 percent. The IHS Markit Flash U.S. Manufacturing PMI rose from 55.5 in January to 55.9 in February, registering the best reading since October 2014 and boosted by accelerating new orders (up from 56.7 to 57.8) and employment (up from 55.0 to 55.8). Similarly, the index for future output (up from 66.9 to 71.0) was just shy of December’s reading (71.1), which was nearly a two-year high. More importantly, this suggests very healthy growth in production over the next six months. At the same time, current output (down from 56.2 to 56.1) and exports (down from 52.9 to 52.1) eased slightly in the February survey but continued to grow at a promising pace. On the downside, input prices picked up in the latest survey (up from 58.6 to 61.9), with costs expanding at rates not seen since December 2012. Meanwhile, manufacturing activity in Europe remained robust despite easing for the second straight month from December’s fastest pace since the introduction of the survey in June 1997. The IHS Markit Flash Eurozone Manufacturing PMI has declined from 60.6 in December, to 59.6 in January, to 58.5 in February, a four-month low. The underlying data continued to be encouraging despite softer growth across the board, including for new orders (down from 59.6 to 58.1), output (down from 61.1 to 59.5), future output (down from 68.2 to 66.7), exports (down from 58.4 to 56.8) and hiring (down from 57.9 to 57.2). Input costs also remained highly elevated despite a slight deceleration in February (down from 70.7 to 68.4). In addition to data on Europe as a whole, IHS Markit also released figures for France (down from 58.4 to 56.1) and Germany (down from 61.1 to 60.3), both of which slowed to multi-month lows on weaker—but still reassuring—demand and output growth. Final data on each of these surveys will be released on March 1. The Kansas City Federal Reserve Bank reported that manufacturing activity continued to expand strongly in February, building on solid growth seen over the past year. The composite index of general business conditions increased from 16 in January to 17 in February, a four-month high. Many of the key underlying data points also reflected faster growth for the month, including new orders (up from 14 to 16), production (up from 16 to 21), shipments (up from 14 to 24), employment (up from 18 to 23) and the average workweek (up from 2 to 11). Forty percent of respondents said new orders increased in February, with 24 percent citing reduced sales. At the same time, exports slowed somewhat but remained positive for the third straight report (down from 6 to 2). On the downside, the index for prices paid for raw materials soared to its highest point since May 2011 (up from 34 to 50), mirroring other recent indicators showing accelerating input costs. Half of the manufacturing leaders responding to the survey said their raw material costs rose in February, with just 2 percent noting reductions and 48 percent suggesting no changes. This is a trend that is expected to continue moving forward, with the forward-looking index for input costs (up from 58 to 73) jumping to a level not seen since March 2011. Accordingly, 69 percent of manufacturers in the Kansas City Federal Reserve district see raw material prices rising over the next six months, with 1 percent predicting declines for their firm. Meanwhile, manufacturers feel more optimistic about the next six months. The future-oriented composite index increased from 29 to 38, an all-time high in the survey’s 17-year history. More than 60 percent of respondents anticipate higher new orders, production and shipments in the coming months, with 46 percent and 48 percent seeing more employment and capital spending, respectively.